Dictionaries Out of Order defies simple description. Its stories, which intersect at Portland’s “City of Books,” range from the silly to the sublime, veering expertly from philosophy to farce. At its heart, the book is a love letter to the awesome and mysterious power of words. As comical as it is profound, this unique and unforgettable collection confirms that David Michael Slater is one of the most versatile authors writing today. A highly entertaining and thought-provoking collection of short stories. Through each of the vastly different characters and scenarios he creates, Slater explores and plays with questions about the role of words and language in our reality. By turns the stories are funny, painful, surrealistic, always creative and a pleasure to read. 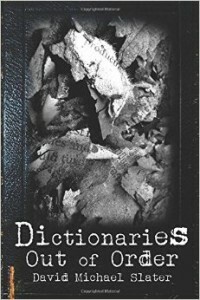 For those familiar with his popular young adult adventure stories (Sacred Books series), Dictionaries Out of Order brings Slater’s excellent writing, fascination with language, and talent for creating a good story to an adult audience. David Michael Slater’s Dictionaries Out of Order is a trip. It is a mystery. It is a tour. It is a flight around the world from Powell’s Books to Mikhail Bulkagov’s backyard bathroom at midnight; from John Wesley’s Georgia to Three Rivers Stadium–with stops in Warsaw and the Vatican–and with visits by Comenius and by the author himself– that writer of picture books and historical psychological reflections, Mr. David Michael Slater….”Dictionaries” is a dark, hypnotic peek into the unbreakable entanglement of the Human and her prime tool–Language. The great thing about short story compilations like Dictionaries Out of Order is their ability to take the reader on various satisfying journeys and outstanding single-serve adventures. They’re perfect for popping open and drinking down in both small doses or all at once. Oftentimes, jumping from one story to the next in one sitting is like riding the metaphorical roller coaster so many writers aim to create in their larger works, and when an author manages to pull off those emotional peaks and valleys multiple times over the course of a compilation it makes for a pretty great ride. What’s even better is when overarching themes and subtle subtext is liberally spread throughout the entire collection, and the many love letters author David Michael Slater has compiled here share a common curiosity and awe in the written word, a hodgepodge of symbolisms and moralities from Greek mythology, and various acts of creation. It’s obvious Slater feels the power of prose exists and influences on multiple levels, and he tries to share his insights and observations through what ends up being an entertaining, if not educational, collection. It would be interesting to know if he set out to intermingle these adventures and anecdotes with the common theme always in the background, or if Dictionaries Out of Order was a coincidental collaboration between shorts he’d written over the years. Aside from the thread that worked its way through the various pieces, I really enjoyed the introduction story that set up the compilation’s contents in a uniquely ambiguous way. It’s fun to think about reading a book so amazing it’s driven sane men to insanity, and Slater set up his collection with a simple-yet-imaginative framing device that lent itself to some pretty cool speculation. Fans of the written word and all the magic behind the strange symbols and swirls we assign to different emotions and aspirations, this book was written for you.